Introduction: Two of my favorite groups of plants are duckweeds (subfamily Lemnoideae) and sea beans (Family Fabaceae). Sea beans include many species of tropical drift seeds that ride ocean currents of the world and wash ashore on distant beaches. 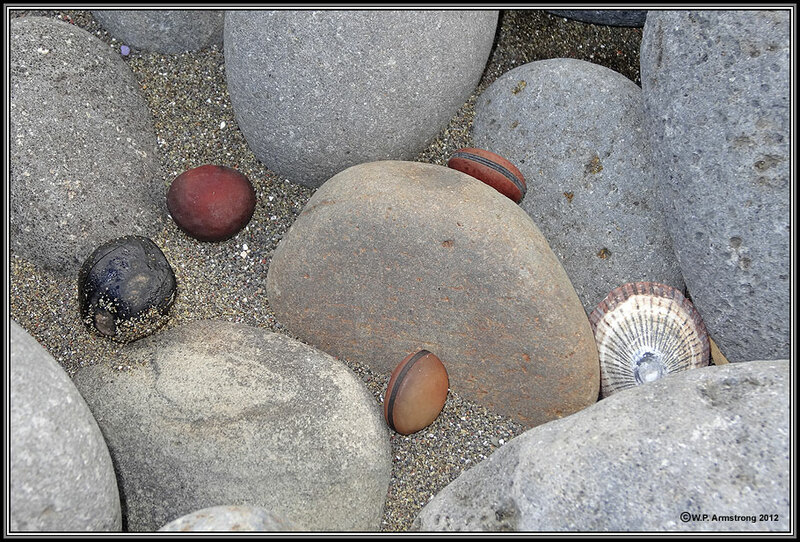 Due to the lack of suitable currents, they are seldom found on Pacific coast beaches of North America. In fact, my California 7 character license plate SEABEAN was readily available since drift seed collecting is not popular in California! Sea beans are produced in seed pods on woody vines (lianas) that grow in rain-soaked coastal forests of Maui. 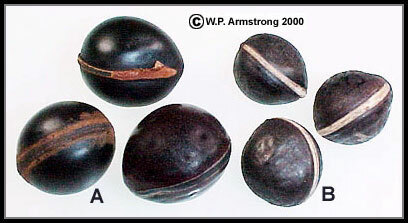 According to Wilmot-Dear (1989), the sea bean on Maui is a Polynesian species Mucuna gigantea ssp. gigantea. Two varieties of M. sloanei are also recognized in the supplement to the revised Flora of Hawaii (1999), indigenous var. sloanei on Kauai, Oahu and Maui, and the endemic variety persericea on the east coast of Maui. Inlet on the southwest coast of Maui. 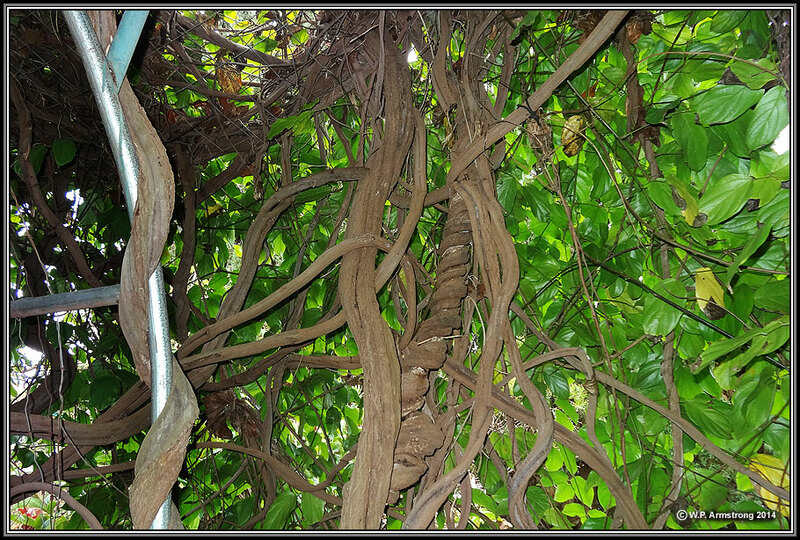 Sea bean vines (Mucuna gigantea ssp. gigantea) grow on rainforest trees in canyons and steep slopes. 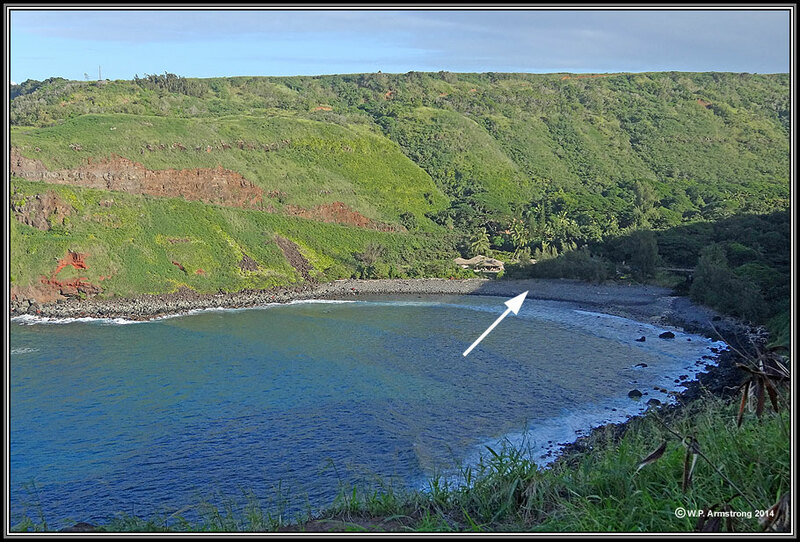 After heavy rains, the seeds are carried down streams into the ocean and washed ashore on beaches (white arrow). Sea beans on rocky shore of previous image. The large, black seed is a kukui nut. 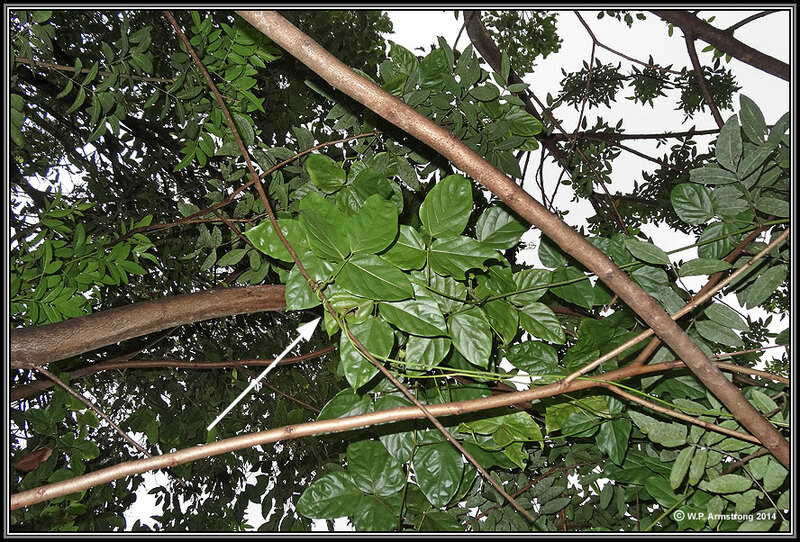 A rainforest understory, looking up at sea bean lianas with large trifoliate leaves. 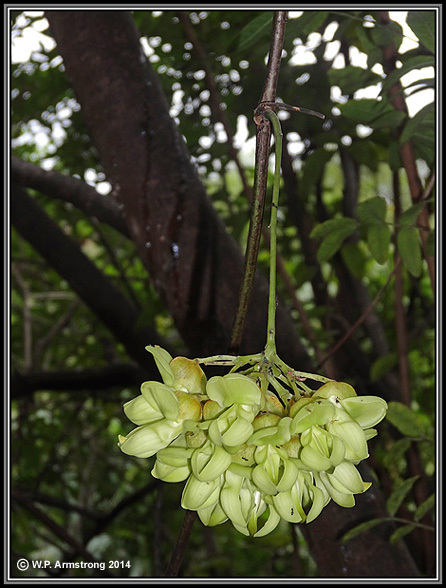 In lower image a cluster of greenish flowers is hanging from the vine. Photo was taken on the north side of Maui, on a steep rain-soaked slope below the Hana Highway. 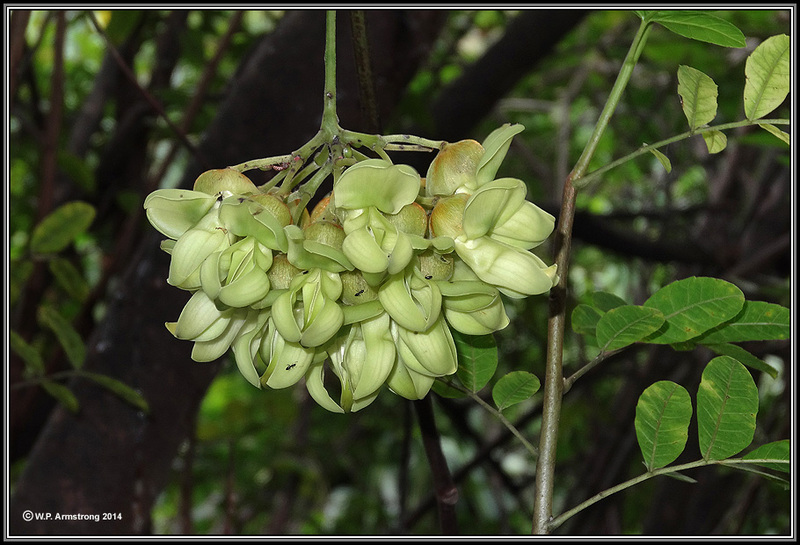 A cluster of greenish Mucuna gigantea ssp. gigantea flowers hanging from the forest understory. Photo was taken on the north side of Maui, on a steep rain-soaked slope below the Hana Highway. The sweet-smelling blossoms were covered with white-footed ants (Technomyrmex albipes). See Part 8 for images of this ant. 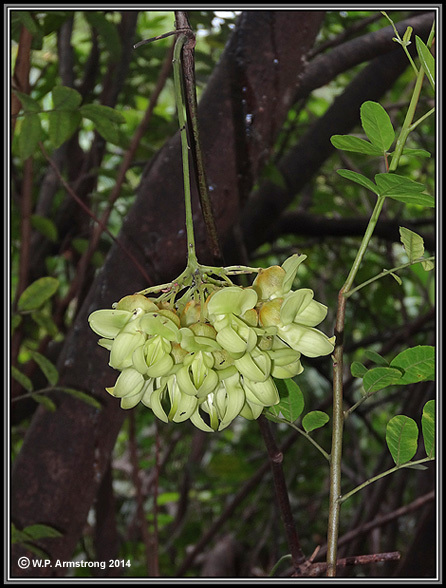 Flower cluster and immature seed pods of Mucuna gigantea ssp. gigantea. 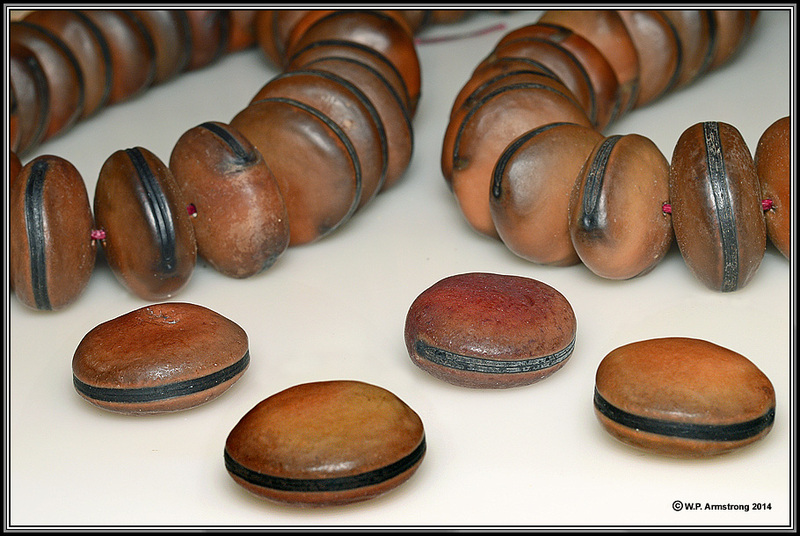 Each pod produces several woody sea beans. The pods are glabrous and without the stinging hairs of M. sloanei. Sea beans are strung into Hawaiian necklaces and leis. 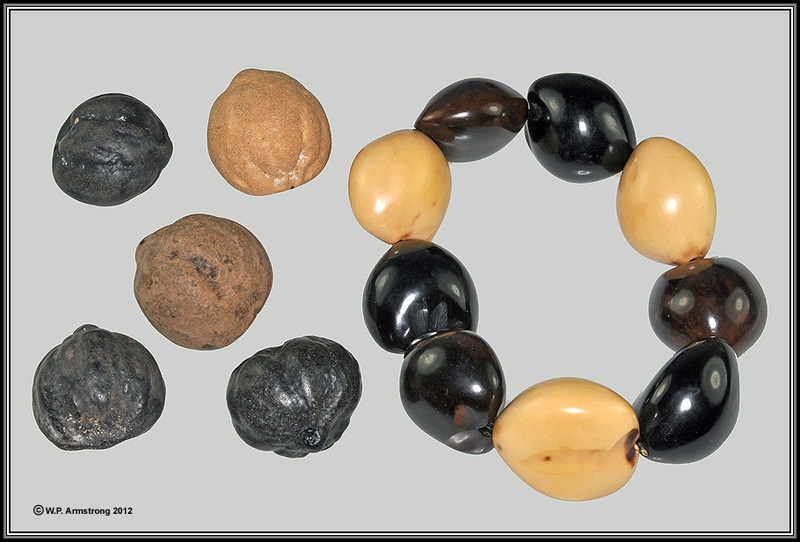 They are not common compared with kukui nut leis and bracelets made from seeds of the kukui nut tree (Aleurites molucanna). See following image. 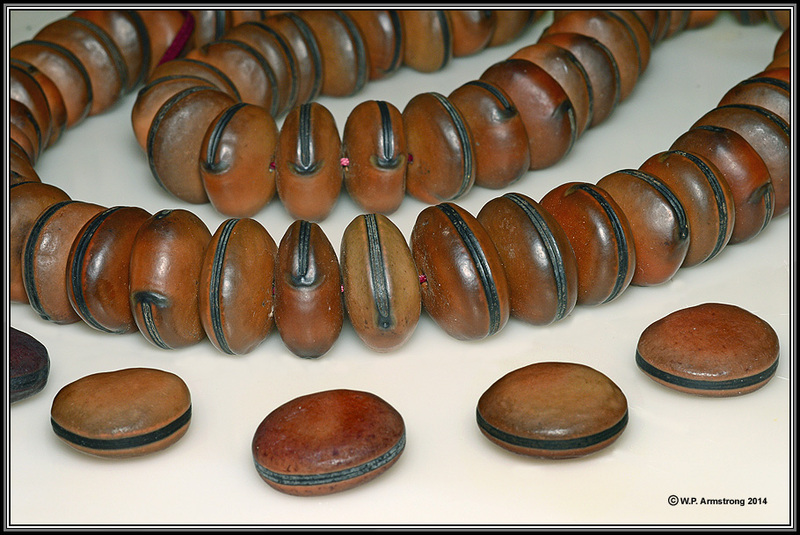 Kukui nuts (Aleurites molucanna) washed ashore on a beach and a polished kukui nut bracelet. Althought it is not native, the kukui nut tree has been designated the official state tree of Hawaii. 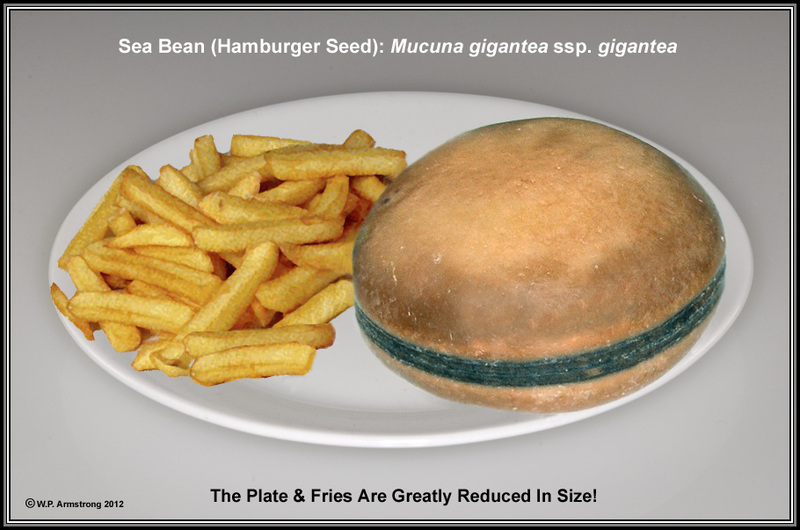 Why Is A Sea Bean Sometimes Called A "Hamburger Seed"? A sea bean Mucuna gigantea ssp. gigantea collected on a West Maui beach on 22 November 2012. It truly resembles a miniature hamburger, especially when compared with an order of fries! I must confess that I greatly reduced the size of the plate and fries. The sea bean is only 22 mm in diamter (just under one inch). What Makes The "Meat Patty" In Your "Hamburger Seed"? Mucuna gigantea ssp. gigantea. 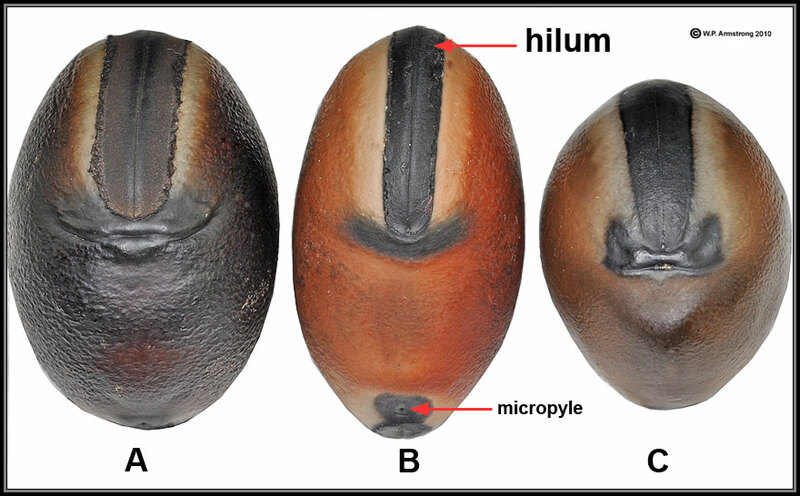 The dark layer in Mucuna seeds that really makes them resemble miniature meat or veggy patties is the hilum. This is the attachment scar where the immature seed (ovule) was attached inside the ovary (developing fruit or pod). It is analogous (but not homologous) to your navel (belly button). In most seeds, it is an oval or circular scar where the seed stalk (funiculus) was attached. In your case, it was where the umbilical cord was attached inside your mother's womb (uterus). 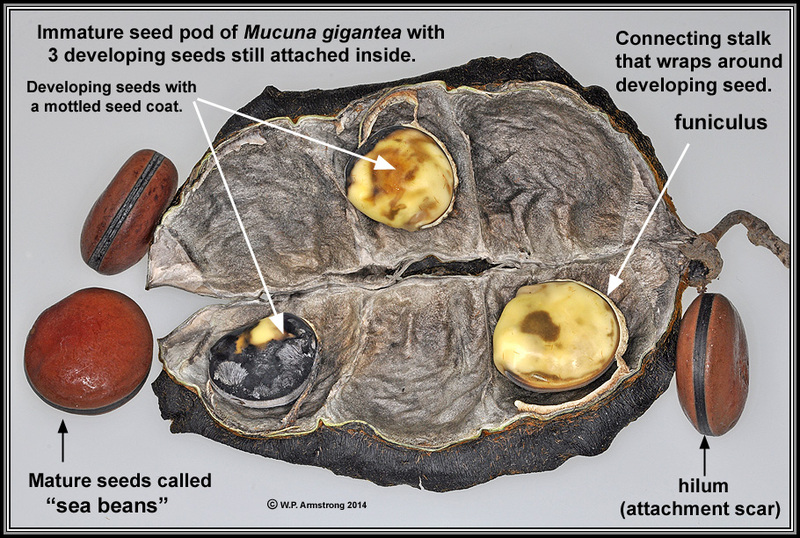 In Mucuna, the funiculus encircles (wraps around) the center of ovule leaving a circular attachment scar. Two varieties of M. sloanei are also recognized in the supplement to the revised Flora of Hawaii (1999), indigenous var. sloanei on Kauai, Oahu and Maui, and the endemic variety persericea on the east coast of Maui. This species was previously listed as M. urens, a similar sea bean that washes ashore on beaches of the Caribbean and Central America. 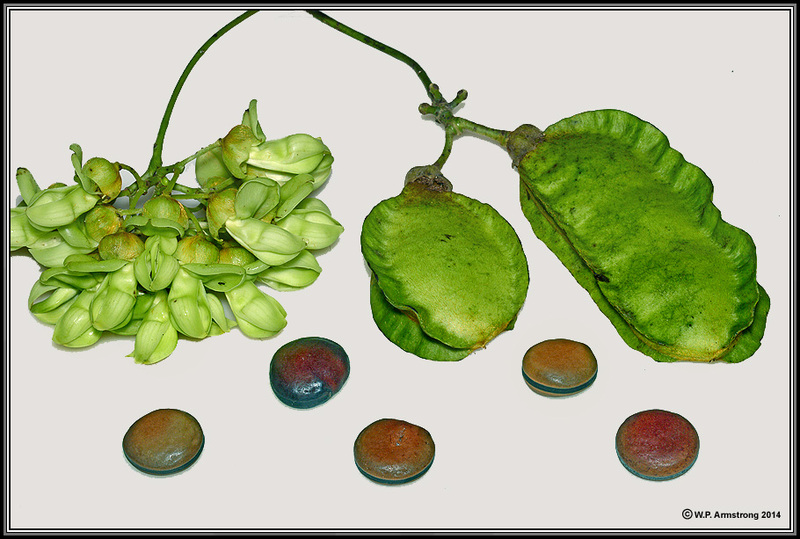 A. Pods and seeds of Mucuna (cf. M. sloanei) from the Monteverde Cloud Forest of Costa Rica. One seed has an attachment stalk (funiculus) that encircles the seed along its hilum. 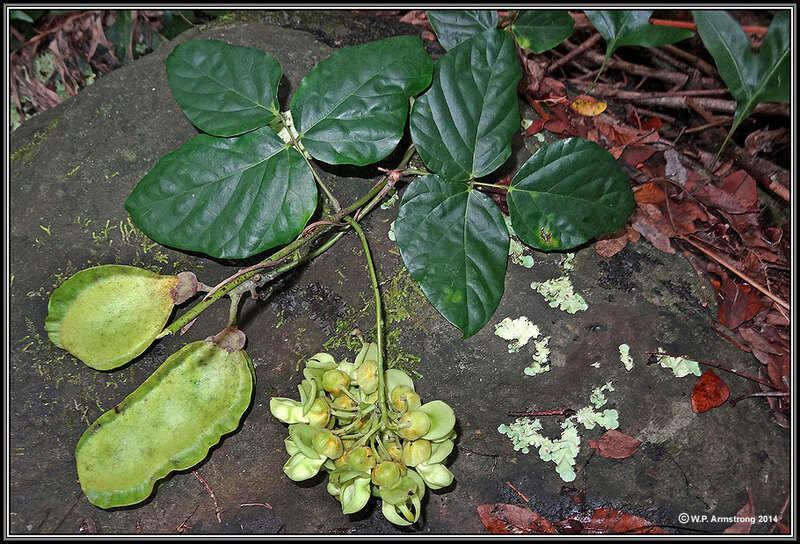 B. Pod and seeds of Mucuna near Golfito on the humid Pacific coast of Costa Rica. The pods are covered with dense, stinging hairs. These may be the same species: M. sloanei (var. sloanei). The var. persericea is endemic to Maui. According to Wilmot-Dear (1989): "Plant identical to the typical variety in most respects but leaf-indumentum beneath of still silky but longer, coarser, more golden-silvery, hairs forming so dense and thick a covering that epidermis completely invisible beneath. Although this variant differs only in indumentum, since the differences are so well-marked with no intermediates and since it appears to be restricted to Maui, it is considered worthy of formal recognition at a varietal level. Possibly this the true local race, the typical variety being a later introduction from other Hawaiian islands." Wilmot-Dear, C.M. 1989. "A Revision of Mucuna (Leguminosae-Phaseoleae) in the Pacific." Kew Bulletin 45 (1): 1-35. Two of the most common species washed ashore on beaches of the Gulf states and southeastern United States are M. urens and M. sloanei. Seeds of the two species are difficult to distinguish, although the latter species appears to be more common. Dr. Gerald Sullivan (The Drifting Seed Vol. 14 (1) May 2008) has devised an ingenius method of separating these two species. Sea beans have a conspicuous hilum that encircles the seed. At one end of the hilum is a small pin point depression called the micropyle where the pollen tube entered the ovule during fertilization. At the opposite end is a peculiar scar (smiley) that resembles a smiling face. It is this "smiley" that separates seeds of the two species. The two types of smileys are shown in the following image. 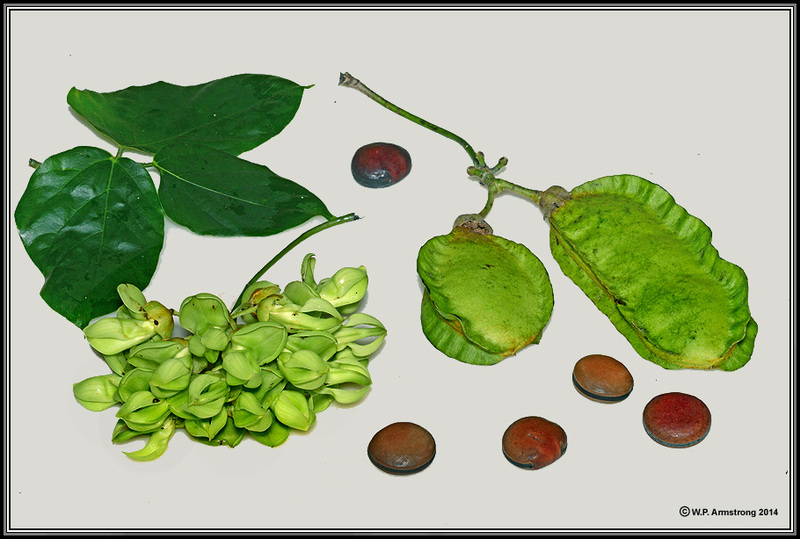 Seeds of Mucuna species showing two distinct "smileys." A. Seed from a pod collected in Golfito, Costa Rica. Originally identified as M. urens, the smiley is more similar to M. sloanei. B. Drift seed of M. urens collected on a beach in Belize. Note the thinner, upcurved smiley and reddish coloration. C. Drift seed of M. sloanei from Belize showing a thicker, blocky shaped smiley. The latter species also occurs in the Monteverde Cloud Forest of Costa Rica. 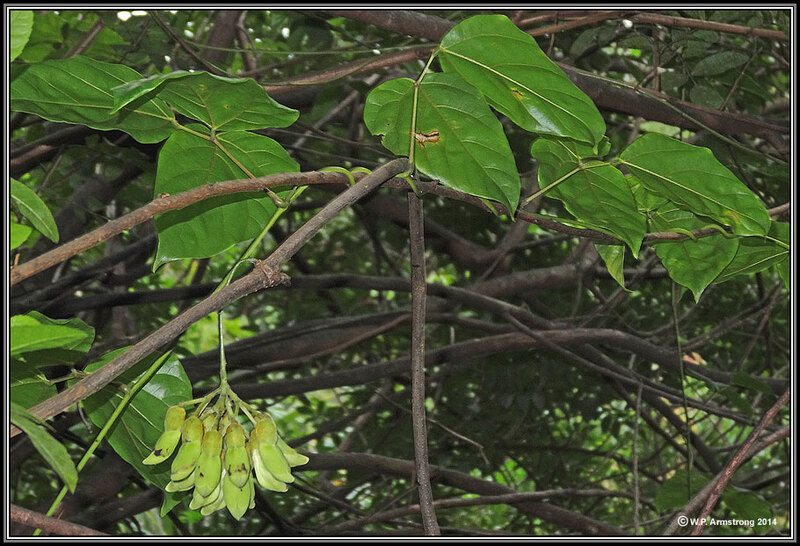 Strongylodon ruber, a climbing woody vine (liana) related to Mucuna. This vine is naturalized on Maui and can form impenetrable thickets in cultivated areas. 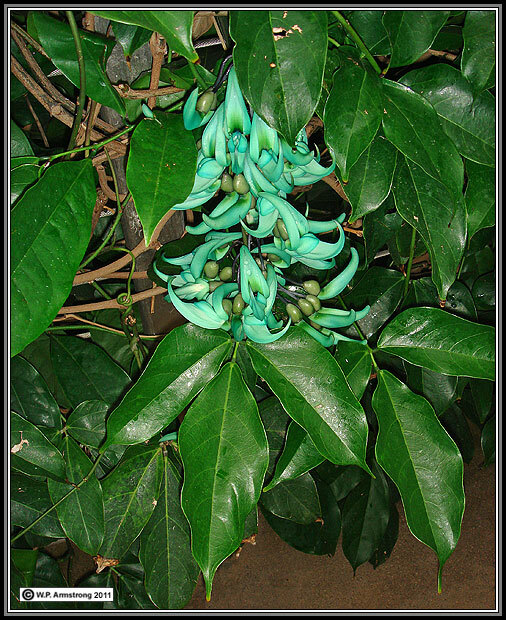 Jade vine (S. macrobotrys) also grows on Maui. 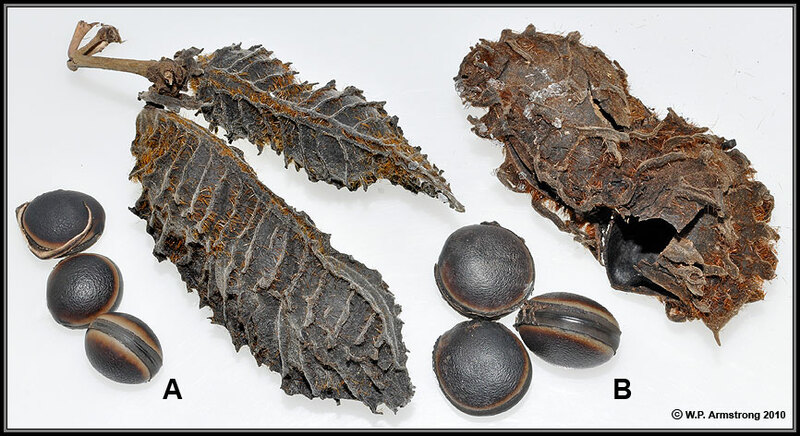 Above: Sea bean relatives that belong to the tropical Old World genus Strongylodon and the New World genus Oxyrhynchus: A. Strongylodon siderospearus from lowland forests on the island of Reunion off the east coast of Madagascar. B. Oxyrhynchus trinervius, a high-climbing woody vine in tropical rain forests of Central and South America. Left: Jade vine (Strongylodon macrobotrys) native to the Philippines. In growth habit it resembles the Guinea creeper (Mucuna bennettii).